It’s been almost a week since I got my hands on Google’s flagship phone, the LG Nexus 5, running the latest Android software: Android 4.4 KitKat. I’ve had a good play around with the phone and have discovered a number of issues that need to be addressed in the next software revision. If you have your headphones plugged in and change the volume using the hardware Volume buttons, the beeping comes out of the speaker and the the headphones (it should only come out of the headphones). An annoying issue when you’re trying to be quiet! Its a odd issue as the button tabs and other sounds come out exclusively through the headphones, so why not the volume sounds? The GPS lock times on the Nexus 5 are very slow. From a cold start (i.e. no cached satellite information), the phone can take anywhere between 15-25 seconds to get a lock (sometimes even longer depending on the area). Compared to my previous phone (the Samsung S4), the times are really slow. The S4 managed to lock on to GPS within 3-6 seconds. 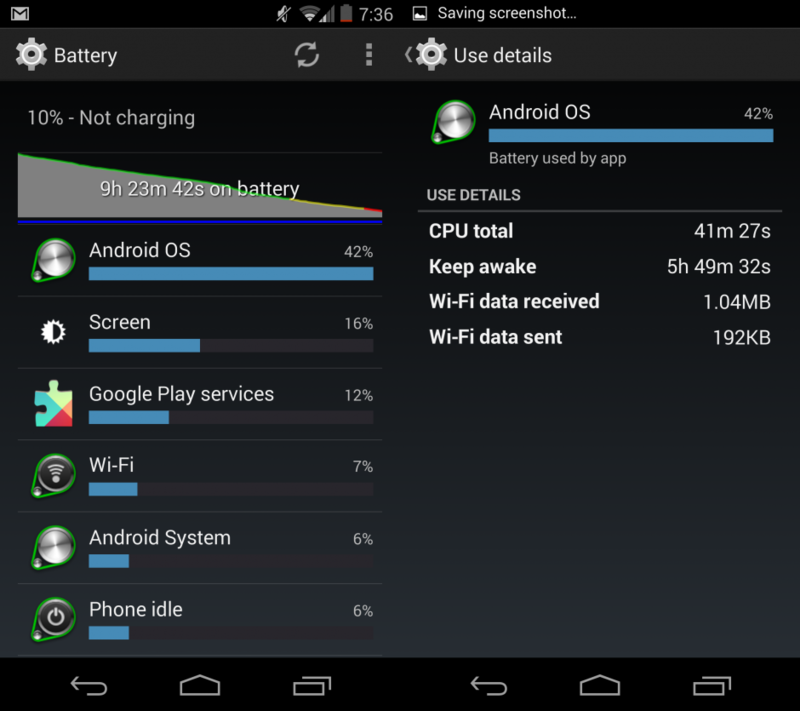 Overnight, I experienced major drain on the Nexus 5, draining the battery in 9 hours while being completely idle. It’s a bug that’s affected other mobile phones in the past, relating to Wi-Fi and the wlan_rx_wake process. Something is using the Wi-Fi network causing the battery to drain quickly. Closing all apps before going to sleep seems to address the issue. Turning of Wi-Fi on the Nexus 5 doesn’t appear to work. While the Wi-Fi network is turned off, the Battery Graph and the Wi-Fi Process still report as if Wi-Fi is running on the device. I tested this by turning off Wi-Fi for a full 13 hours, relying solely on 4G data, but I was surprised to see that the Battery Graph showed Wi-Fi running for the same duration. It could be an issue with Android 4.4 KitKat. It’s clear to see that the Wi-Fi radio is actually turned off, as I cannot see or connect to any Wi-Fi networks. Update: Turns out that you also have to turn off the “Scanning always available” setting in Settings > Wi-Fi > Advanced Wi-Fi for it to actually stop using Wi-Fi. Thank you to +Nicolas Finn for pointing it out. So not technically a bug, but it would be good if the Nexus 5 allows you to use the voice activated search in other languages. At the moment, its limited to devices using “English (US)” as their Voice language. I don’t see why this can’t work in “English (UK)”, since you would have to say exactly the same thing. The status and navigation bars in Android 4.4 KitKat have gradient transparency, blending in with the background. However, on some occasions, it doesn’t fully blend in, leaving a somewhat darker transparent background. Not a major issue but would be good to see it fixed. The transparency can be fixed by opening and closing the notification tray. According to +Sebastian Carewe, this bug happens when you turn off the screen while having the notifications draw expanded. It’s the best way to replicate the issue on your device. If you are using basic security on your phone, like “Slide” to unlock the screen, receiving a miss call will unlock your phone until the auto-lock timer kicks in. This means if you miss a call, you could end up pocket dialing or opening apps while the phone is in your pocket. Using PIN, Pattern or stronger security will prevent this from happening. Google has confirmed that there is a bug with the Nexus 5 that affects sound quality. It’s a software issue and not a hardware issue, luckily, and Google are working on a fix. See the article on Android Central for more information. Updates from Saturday, 9th November 2013, following new bug reports on Google+ and Twitter. Reported by +Ian Rawlings, the back button doesn’t work when using Google Now, especially when you access Google Now while using another application. For example, open Chrome, then swipe up on the Home button to go to Google Now. Pressing the back button Google Now should take you back to Chrome but doesn’t. It doesn’t even take you back to the Home Screen. Even accessing Google Now from the Home Screen and pressing the Back button doesn’t take you back to the Home screen. 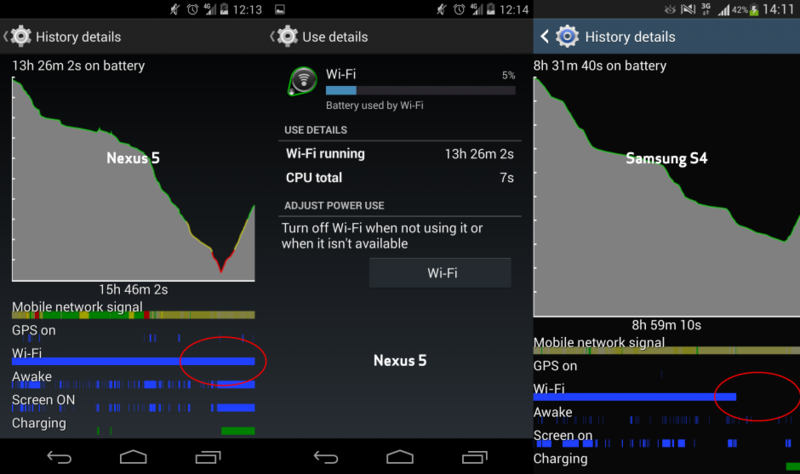 As reported by +Matt Davis, the Wi-Fi on the Nexus 5 sometimes stops working, even though it appears as connected. The Nexus 5 fails to communicate via the connected access point, while other devices continue to function as normally. To resolve this issue, a static IP address needs to be set for each Wi-Fi network you want to connect to. Similar issues have been reported to Google, including problems connecting to Wi-Fi when LTE / 4G is active and the Wi-Fi driver crashing when trying to connect to new Wi-Fi networks. Other possible solutions include switching off the Wi-Fi radio and enabling it, or switching to Airplane mode temporarily. Updates from Sunday, 10th November 2013. Although not related to the Nexus 5 and Android 4.4 KitKat, it’s the first phone to replace the Messaging application with the new Hangouts application for SMS. After restoring my SMS from my Samsung S4, I found that the Hangouts application experiences some serious slowdown when opening conversations with a large number of messages. The below video demonstrates the unresponsiveness of the application when trying to open a conversation with my wife containing 5000+ messages. The video was recorded in real-time to demonstrate the delay in opening and typing messages. I think the delay is cause by the application attempting to load all the messages in a single view, instead of only showing the 50 most recent messages. Applications like WhatsApp handle this well by only showing the recent x messages in the current view. Google should update this application to do the same. Update: Version 2.0.128 (914007-30) of Hangouts is a bug improvement to the stock version of Hangouts on the Nexus 5. The new update has fixed the responsiveness issues, no longer causing the app to force close when viewing large conversations. There is a bug with the Nexus 5 / Android 4.4 KitKat where sharing a Link / App etc results in the same app opening every time. For example, sharing a link from Chrome always opens Google Keep. Several users have reported this issue with various applications. A possible fix is to reset your application preferences. Go to [Settings] > [Apps] and click on the … (Menu) button. Then click on “Reset app preferences” to clear all the default options. This should get the Sharing dialog working again. The Camera App on the Nexus 5 / Android 4.4 KitKat has a issue with multiple applications trying to access the camera. For example, opening Google Goggles to take a photo, then opening another application (e.g. 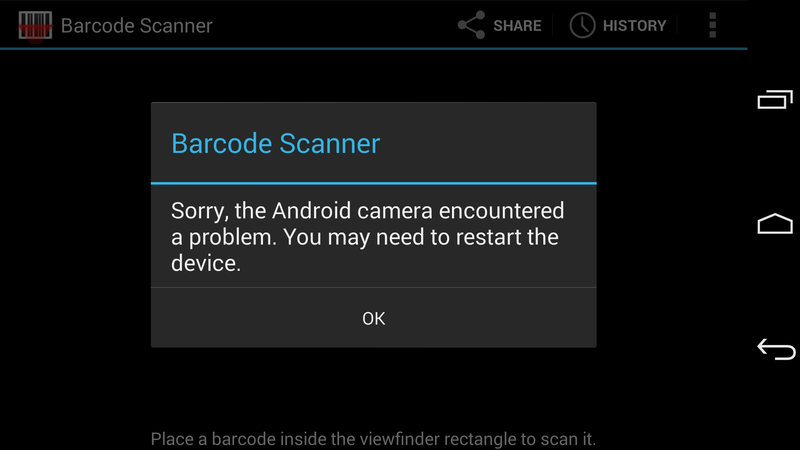 Barcode Scanner) results in an error. The camera cannot be used in the second application until you close the first one – this can be done by closing the application from the Recent Apps menu. The videos on this page were recorded using the Android Debug Bridge (ADB). For instructions, please read this tutorial. Come across any bugs yourself? Please let me know in the comments section below and I’ll include it. I’ve noticed the volume bug and the status bar gradient one too. I have noticed that when I select and set my preference apps to open every time, Kitkat still ask me the same question over and over especially when you have Textatone or GVTalk install and trying to use default dialer as the main dialer. I also found bug when dialing conference lines for example 18001234567;9876#. This would invoke the send prompt once call is connected however pressing send does not send dtmf tones like it should. The pause command had the same issue. Hopefully this gets resolved because manual dialing for conference calls is not a option. My wallpaper is zoomed in and not as crisp as it usually was can you please find a fix? You may not have a Full HD version of your wallpaper. Try finding a higher resolution image and see if that works. Remember, the resolution of the Nexus 5 may be higher than your old device. I’ve noticed that with the new kitkat chrome, file inputs are forbidden, you can’t add photos into a form for example. I tested it after your comment. I seems that the Document option doesn’t always work, but I was able to upload a file using Chrome. Tested using: http://encodable.com/uploaddemo/. Logged into my NZ anz bank app, I tried to take a screen capture and it would not allow it ? Minimise screen or switch to another app it would work OK ! My nexus 4 allowed me to do this but my nexus 5 doesn’t ? Something to do with security maybe ? The phone doesn’t automatically pick up on saved wifi access points and is flaky when it comes to connecting to access points that I manually select. Throwing it into airplane mode and then back again seems to do the trick, but this should really be fixed ASAP. The worst are the exchange bugs. Most notable is that enabling push creates a sync loop that drains the battery and prevents new mail from arriving. I noticed the sharing bug, thanks for the workaround. 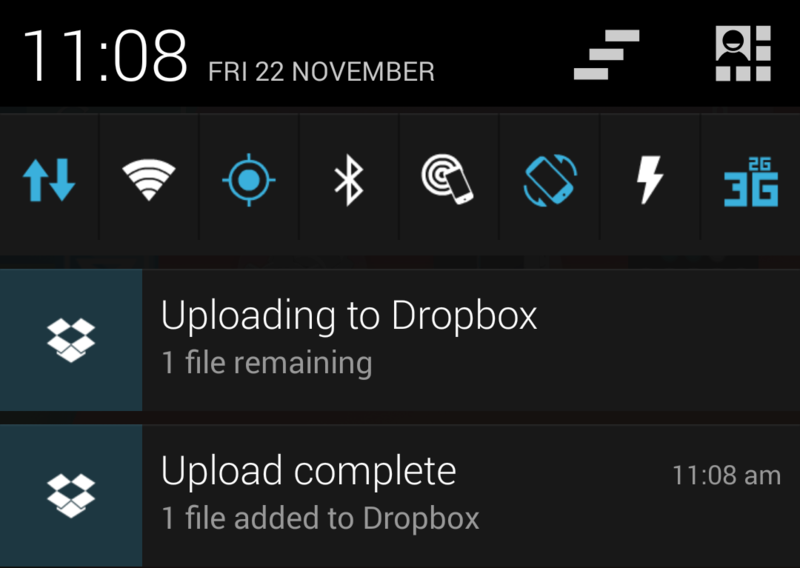 I don’t see a progress bar for Dropbox uploads, but it does give notifications for files waiting and when they’re done uploading. A bit off topic, but I really like your statusbar icons! I am using Elixir 2 but can’t get such nice looking icons. The app I use for the status bar icons is Power Toggles. Only missing a ‘clear cache’ button and the screen rotation button is a two step proces unfortunately. But hey! It looks great! Odd. Screen rotate is a one touch action for me. Use the “Screen Auto Rotate” option instead of the “Rotation Lock” toggle. That’s it Niraj! I used the wrong toggle, stupid me!! thnx alot! No. I’m using stock android. The google plus ‘Photos’ app is able to edit all pics clicked by the cam or downloaded from the net but is not able to edit screenshots captured py pressing the volume down and power key together. It displays an error message saying it cannot save the edits, while the gallery app is able to do it with ease. I no longer can edit Facebook posts using my nexus7fhd,I can my edit myown status. My nexus5 glitches the same but in landscape mode it worked with a little effort. The new webview is a mess. html5 canvas is not hardware accelerated and rendering performance is extremely poor. All games/apps which rely on canvas rendering are slowed down to death. There are multiple bugs raised, but google is completely silent on this mishap. I am in Canada and I have the same issue as you have. You cannot set to 3G network mode, only 2G or LTE. I went to most of the carriers in Canada (Rogers, Fido, Bell, Telus, Koodo, Wind Mobile) and I used the Demo Nexus 5 they have for customers. None of them worked. All failed to keep the 3G option. So this is something really weird. There are some sites that reflects kind of the same issue in Japan with an specific provider and its 3G simcard, but it seems that is not only happening for them. Since my previous tests I would say that there isn’t a provider/carrier issue, but a software or hardware problem. I even called Google but they have no clue and you can now find a lot of forums talking about this “bug”. i found a problem related to battery drain on “Device idle”.. i fully charged my nexus 5 and also turn off wifi & LTE before sleep. i leave it over-night and the battery level is dropped 30% after 6 hrs! i check the battery history and found that “Device idle” & “Cell standby” is eating my battery about 3x% & 2x%! im not sure it is a bug on kitkat 4.4 or h/w problem of nexus 5, is anyone suffer from the same case and got a solution on that ?? Howdy. Just wanted to add some of the issues I have came across. First off some background. Prior to owning my Nexus 5 I had the Iphone 4, aside from the phone being slow I never had any issue with using my Bluetooth headset (Bose Series 2) or call quality issues and or audio issues. The summer before last I purchased a Nexus 7 and fell in love with it so I thought my next device will be a Nexus. Since owning my phone I have had nothing but issues. Running stock. The one issue that plagues me is that for some reason when using Pin lock entering the pin is not responsive about 40% of the time. I can enter the first two digits but then the device will not accept any other screen input. I usually end up waiting for the lag or just pressing the sleep button and then waking it again. Sometimes I get impatient and the lag causes me to enter an incorrect pin. The second issue is with the proximity sensor. It’s horrible. I don’t think it’s the hardware but more the software. Sometimes when I am trying to switch a call from handset to speakerphone the screen will be lit but as soon as I put my hand anywhere near it the display will turn off. Also when holding the phone to my ear sometimes the display will come on and stay on causing my face to dial on the keypad annoying the other person. Today I noticed that the mmq camera daemon was in a wakelock and killed my battery. Lastly Bluetooth issues. Unable to change volume, audio quality is low and sound volume is either maxed or low. Disconnects and reconnects constantly. I updated the firmware on my headset but at this point Bose points to Google for a fix. I was so excited to have a phone running the latest operating system but now sad to realize that Google could care less about fixing issues. When I contacted support they suggested swapping the phone for another. Unfortunately for me, four Nexus’s later I still have the same issues. I have added my experience to some of the bug reports that are already open but the tickets seemed to be closed as soon as 4.4.2 came out even though they have not been resolved. Happy to find your site and hear others are having similar issues. Hopefully we can build a Wiki of common N5 bugs and fixes. I have issues with apps rewinding like I’m hitting the back button or something. Can’t watch videos same with chrome. Or any app. Reset phone and still does it. Guyz i cant get the recent apps function via home key…wat sud i do?? There a dedicated “Recent Apps” button on the phone, so not sure what the problem is. The “Home” key is only for returning back to the Home screen. HI Niraj, My 2 days old nexus 5’s address book takes forever to open… have you faed it? how can i rectify the same? Try turing off Contact Syncing in your Google Account and see if it makes it quicker to load. If it works, re-enable it sync contacts again. Thanks, I sorted it today morning. But I think overall the processor is slow. Also the battery lasts me only for 4hours. Do you think it could be a faulty device and I should return this? As it’s still under warranty, you should get it changed for a new device just in case. The battery could be running down for a number of reasons, like constant Mobile Data connection, apps that force wake-lock etc. There are apps that can help you investigate.